Shoot was a very popular football magazine and was an inspiration for the game with the same name from Microgaming. 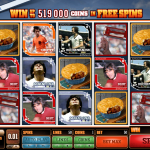 Maradona, Pele and Beckenbauer`s fans will be happy to see the legends return on the scene once again in the form of a video slot game. 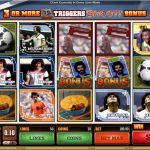 If you are a football fan this slot will definitely be appealing to you since Shoot! Has “fun” written all over. The game will take you back to the golden days with just one click. There are 4 special symbols, the Bonus Symbol, Free Spins, Magazine Bonus and the Wild. Shoot has even 4 bonus features which means the chances to win big are high in this game. The bonus symbol activates the Trade `Em Bonus, if you manage to land 3, 4 or 5 symbols anywhere on the reels. You will have to pick from 12 cards for cash prizes but at the same time you can be taken to the next level where you can play 2 second level bonuses. The Free Spins Symbol will award you between 10 and 35 free spins with doubled wins. The Magazine Bonus Symbol is the key to the Magazine Bonus. Again you have to pick from 12 cards until you find one of the two red cards that will terminate the bonus for you. After you are done playing the secondary bonus you will be taken back to the Trade `Em bonus, if you have more picks left. The wild will substitute for all the other symbols when it is a part of a winning combination, except for the special symbols. Microgaming definitely had football fans in mind first when they created this game. But, at the same time they have created a unique and engaging game that will attract every “slot lover” out there. You think you have what it takes to succeed in the real estate market? Then play Prime Property a 5 reel slot by MicroGaming.